Sometimes we have themed Casual Fridays at work, and today is Nautical Casual. I decided to wear a red and white striped top with blue colored jeans and gold shoes. It gets chilly in our office so I added my favorite white blazer with gold buttons. 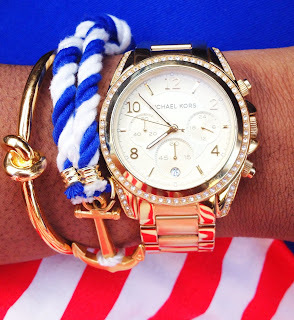 And, I'm wearing my Marley Lilly anchor bracelet, perfect for today's theme! I love this look! It is so cool that you guys have themed Casual Fridays at your office! I've never heard of that before and your arm candy - especially the detail of the anchor is just perfect. Have a great weekend girl! Vett, that jacket is gorgeous and I'm loving the arm candy. Those accent bracelets are too cute! Such a cute outfit, Vett! Love the nauticual theme. :-) Happy weekend! I love it! You look so pretty! I love your nautical attire and the American flag prints. Looks so cool! Thanks for stopping by my blog, btw. would you like to follow each other? I love this outfit! You did a good job!